The Electric Wheelchair with Lift-up Seat is a high quality easy to use electric wheelchair with the added benefit of a seat that can be automatically adjusted from 56 cm to 71 cm in height at the push of a button. Allows individuals to transfer themselves more easily into their bed or a chair, onto a toilet, or onto the floor or a lower surface without injuring themselves or requiring help from someone else and reduces the need for extensive strength in their extremities. Able to lift their seat in order to be at eye level with the person they are speaking to. This ability to raise themselves to the same level as their family members, friends, and colleagues can have a significantly positive impact on wheelchair-bound patients’ self confidence and social interactions. In addition to being able to transfer themselves more independently, individuals with a lift-up electric wheelchair seat elevators are able to function in the world as a whole without as much dependence on others. They are able to lift and lower their own seat in order to sit at a standard height at any table. When they go to the shops they can lift their seat to reach the items they need on higher shelves without asking for help. Wheelchair users with seat elevators are able to function more independently as a whole in shops, restaurants and in their own home. 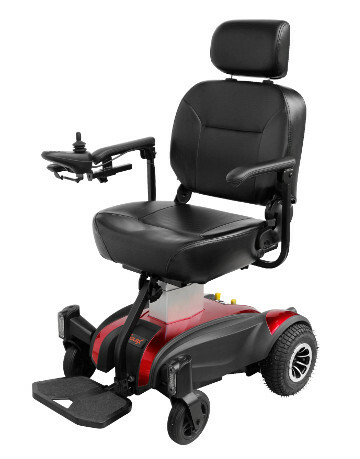 Lift-up Seat - adjusts in height from 56 cm to 71 cm at the push of a button. 180 Watt Motor - powers the wheelchair to a maximum speed of 6 km/h and up a maximum incline of 12 degrees. Rear Wheels - The wheelchair's power is transmitted through the rear wheels. The rear wheels are 25 cm in diameter hard wearing solid tyres. Front Wheels - heavy duty 15 cm. Anti-tipper Wheels - Anti-tipper wheels are an essential safety feature as they ensure that the electric wheelchair cannot tip over backwards. Easy to use Joystick Control - Forward, reverse turning left or right are all controlled by a joystick. The joystick can be set up for either right hand or left hand use. Flip-up Armrests - Flip up armrests make it easier to get in or out of the wheelchair. Rechargeable Batteries - Dual rechargeable lead acid batteries are reliable and give the wheelchair a great range of up to 15km per charge. Most orders take 3-5 working days to deliver and are dependent on where we are delivering to. Outlying areas can take longer than city centres. Please allow up to 10 working days for delivery. Got a question about this product? Just fill out the form below and we'll get back to you as soon as possible. Alternatively you can call us on 086 107 2387.